An itinerant gypsy woman, outcast by her family, finds herself in a fine old country house at the turn of the last century. She has been occasionally invited there to have a meal and a bed for the night by the housekeeper she has befriended, in exchange for a palm reading or fortune telling. Impressed by what she sees, she has aspirations to make the property her own and decides to manipulate events to further her ambition in that respect. Despite the circumstances appearing to be unfavourable, she manages to successfully manipulate events to the point where her ambitions are finally realised only to discover that an error of misjudgement has been the author of her downfall. At times spooky, at times hilarious, at times surprising, this dark drama will have audiences on the edge of their seats. 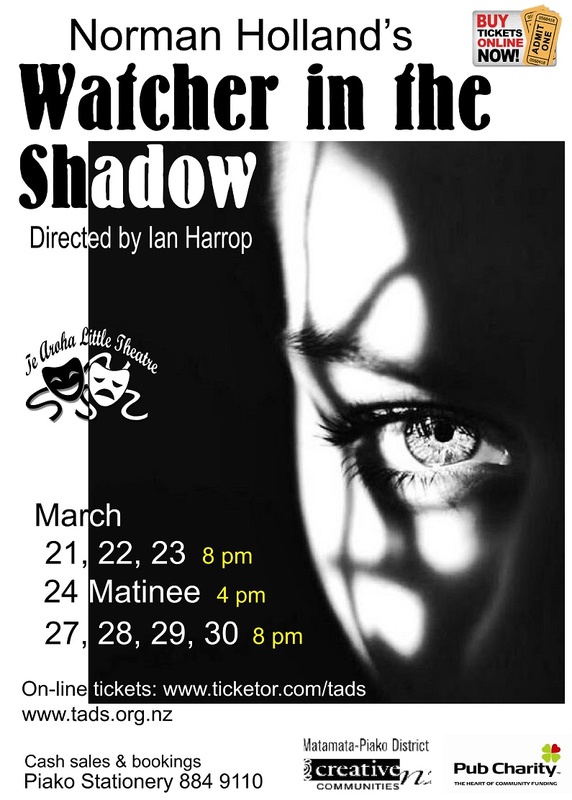 Performances of Watcher in the Shadow are on March 21, 22, 23 at 8pm and 24th at 4pm; March 27, 28, 29 30 at 8pm.